I’ve learned to ignore the bad titles of Clea Simon’s Pru Marlowe Pet Noir Mysteries. They’re not really a good reflection of the books and seriously? When Bunnies Go Bad? Trust me; it isn’t as awful as it sounds. 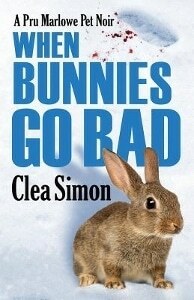 Clea Simon is one of those rare cozy mystery writers that can make each book stand alone. When Bunnies Go Bad is the sixth in the series and I’ve only read one other, but she didn’t leave me feeling confused or too under-informed. That’s a great skill. In this installment of the series, main character Pru is indeed working with a bunny. Two, in fact. One is the sort she’d normally work with, the kind with four legs. The other is the kind you find on a ski slope. Neither one is what it appears. Pru Marlowe has a talent – one that is both a blessing and a curse. She can communicate with animals. It isn’t really talking, it’s more like emotional telepathy. Except with her cat – they straight up read each other’s minds. She works as an animal trainer – walking recalcitrant dogs and such. She needs to use her ability in order to make a living, but she absolutely does not want other people (including her law enforcement boyfriend) to know about it. That landed her in a locked ward once, an experience she is not eager to repeat. So in When Bunnies Go Bad, Pru is working with an actual rabbit – a little guy who was brought in from the wild and tamed as a pet (a practice of which she thoroughly disapproves) and whose owner’s mother is concerned is unhappy. Rabbit emotions are hard to decipher, so he has Pru stumped. The main mystery involves the ski bunny and her boyfriend who managed to get himself murdered. Pru ends up involved because the woman has a little dog sending off very odd signals about both the woman and the murder. I like Pru Marlowe. She’s a little edgier than your average cozy mystery protagonist, and with far, far fewer quirky relatives and neighbors. A local mobster, the boyfriend, and some acquaintances around town are about it. Her tightest, and most interesting, connection is with her cat. Simon avoids the mistake of making Pru into a Dr. Doolittle, instead making her abilities vague and sometimes misleading. That way Pru has to really solve the case rather than just being told by a passing squirrel whodunit. When Bunnies Go Bad is reasonably well paced, with a little bit of a slow spot in the middle when Mr. Local Mobster shows up and a mystery that is needlessly complicated in places. Still, the book is a solid entry in the series – it gets 3 stars and a recommendation for cozy fans that love animals, like a little bit of the paranormal, and don’t mind some edge to their heroines.